June 18, 2013 - 29 year old Hungarian Zoltan Farkas has been announced as the new manager of Hungarian second-division club Bekescsaba 1912 today. The supporters' reaction has been cautious, they've needed a shakeup in their club, but giving the reins to a 29 year old manager in his first job seems curious to them. Farkas has previous experience professionally as a player, but his career ended suddenly after a collection of hamstring and knee ligament tears he struggled to come back from. Farkas was optimistic in his first press conference, saying he had grand ambitions for the club and planned to prepare the club to get promoted, then compete in European football. Bekescsaba doesn't have a lot of success in their history, they've only won one trophy, the 1988 Hungarian Cup, where they defeated Honved in the final. They have made appearances in the UEFA Cup Winners' Cup, the UEFA Intertoto Cup, and the UEFA Cup. Physicals listed because at such a lower level, that's what's important. I will be undergoing an interesting position conversion for Nemanja Scekic. 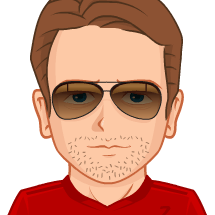 He plays goalkeeper, but has the physical attributes (especially high jumping reach that I like) to play center back. I will train and try him at that position. Otherwise, not much to see here. 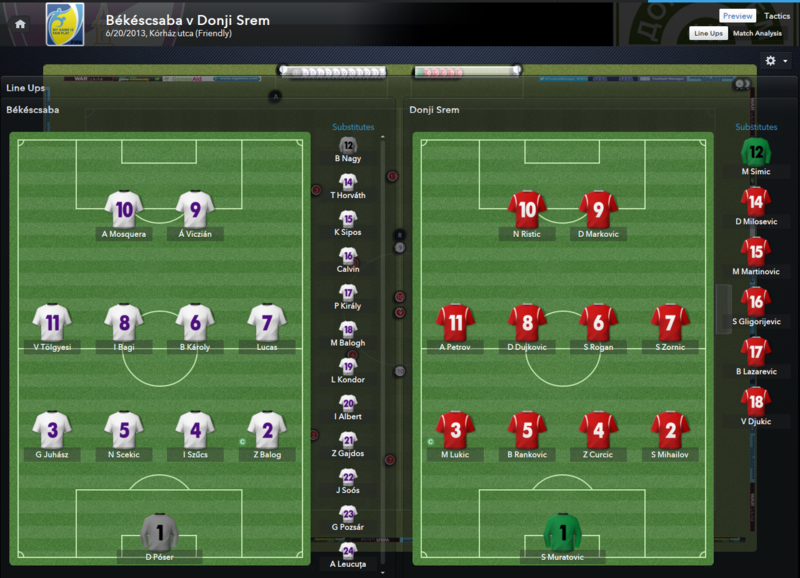 I will be playing a basic 4-4-2, with direct play. 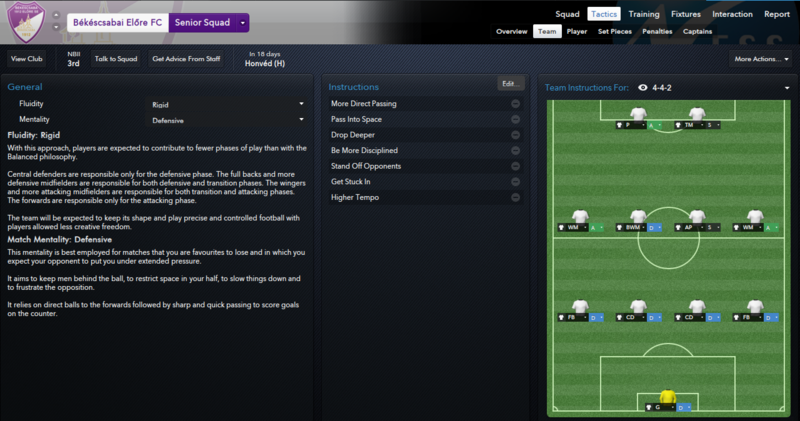 I plan to get more adventurous as I sign better players, but for now, a basic tactic for a basic team. I don't have enough wage budget to bring in players, and I don't think I'll be able to sell any players, so it will be a tough time building up. - 15th minute: Arbey Mosquera cuts to the left, swings in a cross to the target man Adam Viczian for the score. 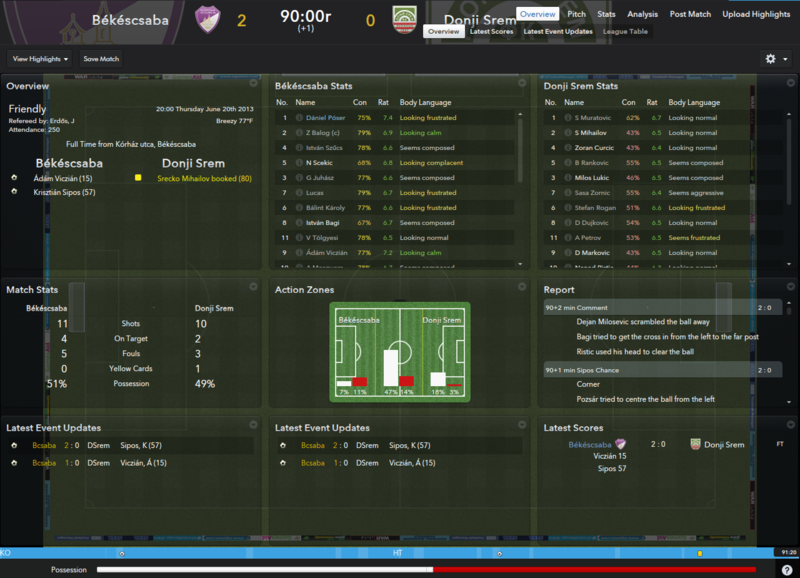 - 30th minute: Skecic makes a mistake that almost leads to a Donji Srem score. - 55th minute: Lucas scores but his goal is disallowed for being offside. - 57th minute: Zsolt Gajdos crosses from the left to Krisztian Sipos for Bekescsaba's second goal. AS you can probably tell by me forcing a goalkeeper into a center back's role, I need to sign one or two more center backs if I can. I didn't have enough cover for this matchup and I need to keep my players fresh. We did an okay job of creating chances, we just need to finish them when we get them. Skecic did an okay job of playing center back, but he needs more playing time to get used to the role. 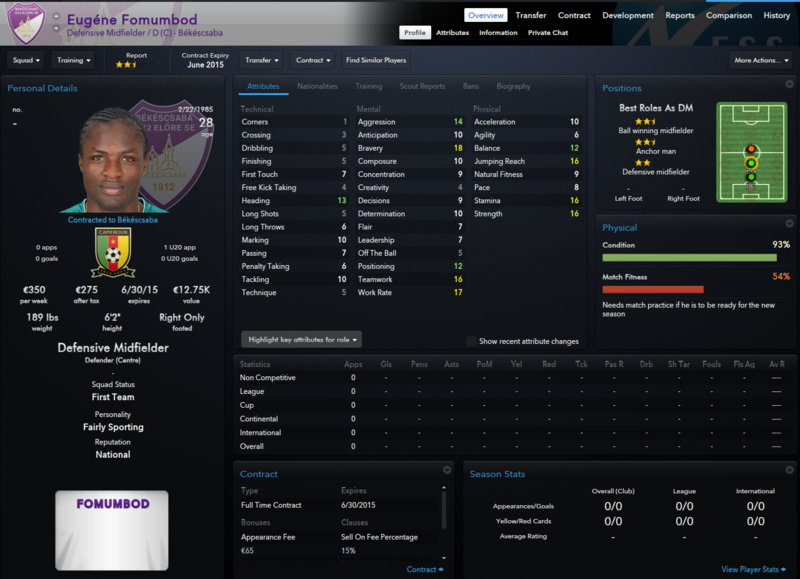 Cameroonian DM/CB Eugene Fomumbod has signed with Bekescsaba to fill a deficiency at center back. 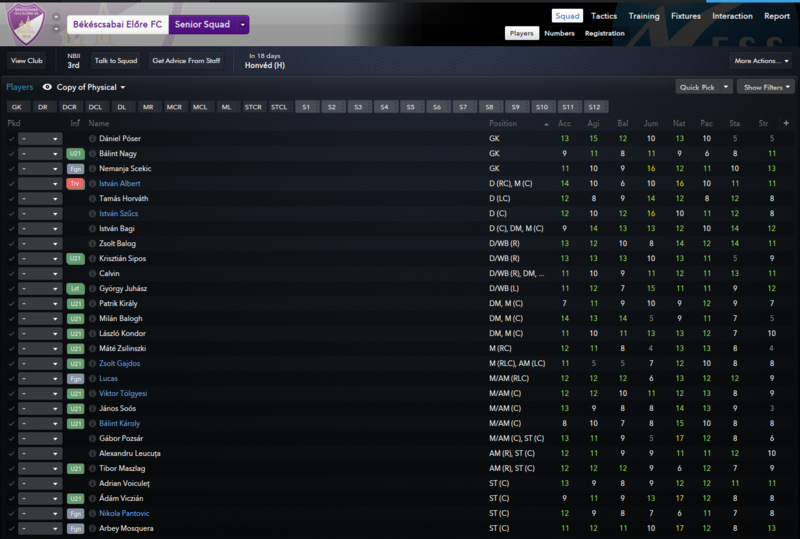 He is well-traveled among the Hungarian league system and hopefully his experience can be helpful for the club. Bekescsaba continues to load up on center backs by signing 36 year old Hungarian Robert Molnar. He is basically the "break in case of emergency" option, and hopefully Bekescsaba won't have to trigger his automatic extension clause. I holidayed through this match since I didn't want to see two tired teams. 32 year old Gabor Poszar reportedly wants out of Bekescsaba, and Farkas is eager to oblige. He has been sold to Szigetszentmiklos for 2,000 Euros. Seems like a small amount, but it gets a contract off the books and a bit of cash into the club. 30 year old Hungarian left winger Krisztian Pali has signed with Bekescsaba. 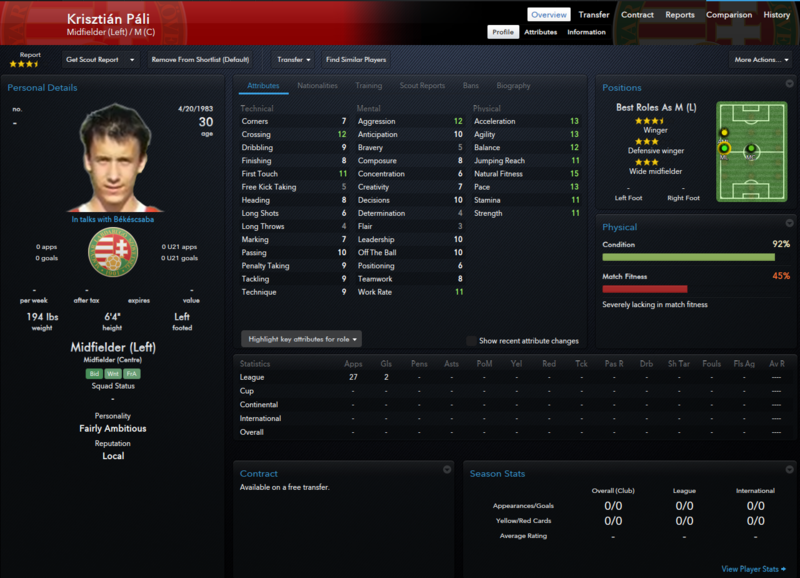 With their lack of a true left midfielder, they needed to sign one, and Pali looks to be a decent bargain option. - 15th minute: Arbey Mosquera takes a long pass from Istvan Albert, rounds the keeper and puts it in the net! Goal for Bekescaba! - 38th minute: Lucas beats the Nagyatad left back down the right wing and gets his cross in to Adam Viczian in the six-yard box to make it 2-0. - 41st minute: Mosquera beats his marker and receives a long pass, then scores his second goal! - 58th minute: After a spell of dominance by Nagyatad that resulted in some near-misses, Mosquera roars back with his third goal for the hat trick. - 74th minute: Lucas streaks down the right wing, cuts inside, and scores one of his own. 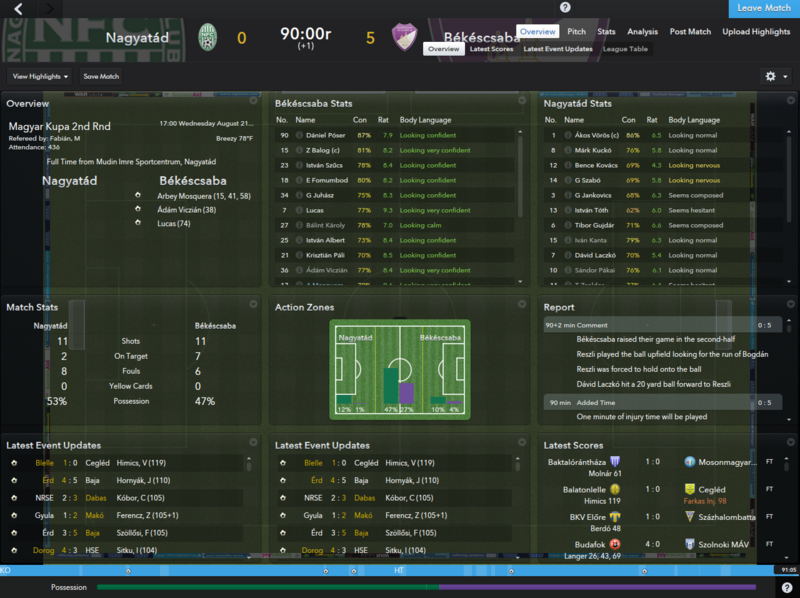 Arbey Mosquera is clearly a key player, as this match proves. It was a shellacking of a much worse team, but hopefully it got the confidence flowing and we can carry this into the season. You are reading "Bekescsaba 1912: First Hungary, Then Europe". Handcrafted in Symi, Hellas. Page created in 0.46 seconds.